During industrial construction hand held sprayers are commonly used for numerous purposes. 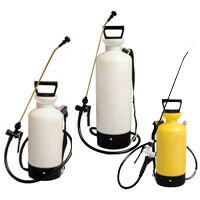 They are used for spraying pesticides, acids, oil, sealers, diesel, etc. It is a portable tank with a wand attached to it. The liquid is compressed in the tank and through the wand it comes out in a fine spray. The person spraying the chemical has to carry the tank in one hand and hold the wand in the other. Ease of Use: Industrial construction sprayers are portable and easy to carry around and can carry up 3.5 gallons of any chemical. Supports Numerous Chemicals: The industrial grade sprayers are made to stand numerous chemicals these include oil, oil-based sealers, diesel, water, water-based sealers, acid stain, hydrochloric acid, acid etching, etc. Sealed: The tank's piston pump is sealed tight with rings that withstand very high pressures. Virgin Plastic: This is plastic that is completely new and has never been recycled. Recycled plastic is not as strong as virgin plastic and these sprayers need strong virgin plastic in its manufacturing. Farming and Agriculture: Chemical fertilizers and pesticides are often sprayed during farming of fruits and vegetables. These chemicals are necessary to enhance the fertilization of the soil and to kill any pests that may spoil the new harvest. Pest Control: For the pest control in houses and other living spaces these hand held sprayers are used to spray liquid insecticides. When pest control is carried out the house has to be emptied for a few days. The insects take some time crawl out and die from the homes that they have made in the walls and other places. Janitorial: A hand held sprayer is often used for cleaning. Some places that may catch rust or tons of grime over the years. They are sprayed with acids for cleaning purposes. The high pressure pumps are then used to wash away all that dirt with water and detergent. Forestry and Gardening: Plants attract insects very commonly. Some insects even tend to eat away the plants. That is why some special insect killers have to be sprayed around them to keep the plants healthy and safe. The hand held sprayer is used to spray dangerous chemicals. Often they are also used to spray acids. Necessary precautions need to be taken when using these industrial sprayers. The best way to use these sprayers is to covers your body and face. When using a sprayer make sure that you are wearing a body suit that covers your entire face and body. The suit should be non-reactive to the chemicals being sprayed so that it does not come in contact with the skin. Inhaling fumes of some of these chemicals can actually be very hazardous to health. Contact with skin can also result in many skin diseases. Therefore, use with care. Machinery pressure washing, industrial cleaning, machinery powerwash, and equipment pressurewashing. Protective eyewear and protective equipment.